Friday, Oct. 27 and Saturday, Oct. 28 at 7:30 p.m.
Sunday, Oct. 29 at 3:00 p.m.
With equal measures of pluck and positivity, little orphan Annie charms all despite a next-to-nothing start in 1930s New York City. She is determined to find the parents who abandoned her years ago on the doorstep of an orphanage run by the cruel Miss Hannigan. With help from the other girls in the orphanage, Annie escapes to the wondrous world of NYC. 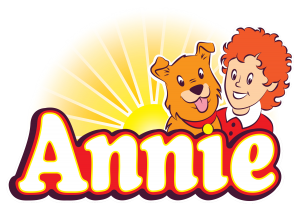 Annie foils Miss Hannigan’s evil machinations, befriends President Franklin D. Roosevelt, and finds home and family with billionaire, Oliver Warbucks, his secretary, Grace Farrell, and a lovable mutt named Sandy. See the bios and photos of our Annie cast members. Winner of the Tony Award for Best Musical, Annie is based upon the popular Harold Gray comic strip Little Orphan Annie. Annie is presented through special arrangement with Music Theatre International (MTI). www.MTIShows.com Praeclara presents this production of Annie in partnership with Wildwood Park for the Arts.